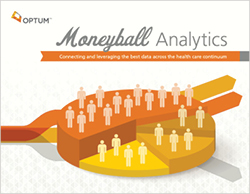 How analysis of big data can cut costs, improve outcomes. Famed Oakland A’s manager Billy Beane used a controversial approach to building a better – and cheaper – baseball team. He started using data differently. The idea inspired the book and movie - Moneyball. Health care has the chance to rethink its use of analytics and similarly spark a revolution – one that can improve outcomes and cut costs.